A fantastic book with endearing characters and a story line that will keep you totally engaged from beginning to end. The thing about Karen Witemeyer's books is that her characters come alive, along with the events they are placed in. You put yourself into the story and feel the emotions they feel and are invested in their joys and pains. Also, her characters are so realistic. Such as, in this book, the hero is not some buff cowboy who looks like an Adonis! He's actually a nerdy kind of guy with glasses that rides a bicycle! Unusual when everyone else is riding horses! But, Amos is his own person and comfortable in his own skin. I liked him so much because he was sweet, kind, loved his family and especially, became a hero when he needed to. It was a little scary, but, he stepped up and did it for his Grace, the heroine of the story! Grace is very shy and has a sad backstory. She has come to the women's colony to "hide" basically from her past but it catches up with her. She is a telegraph operator and "meets" Amos over the telegraph wires because he's an operator also, in another city. When he "overhears" an urgent message about Grace that could put her in danger, he thinks nothing of riding to her safety. I love all the characters in this women's colony and each one has a great story. We learn about others too. This book has a suspenseful story going on as Grace is involved with criminals looking for her and the whole town rallies around her to help. As I said, this book is wonderful and you'll not want to put it down! I recommend it! A sweet clean romance filled with mystery, grief, love, faith, and strength, the reader finds two romances in this book. 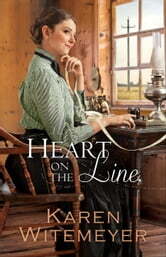 Witemeyer's characters live in an all woman town, Harper's Station; the sheriff and goods transporter the only men allowed. I loved how the town, filled with women, supported and loved each other as family. What a unique and original job Whitimeyer gave Grace. Whitimeyer included the inequity of pay and positions for women during this time period. What began as after work telegraph conversation with a telegraph operator, Amos, became much more. It was wonderful how well they communicated. When Amos rushed to Grace's aid, I knew he was keeper. Far from the brawny cowboys of the west, Amos wears glasses and a suit and is insecure as the woman of his town always overlooked him for the handsome cowboys in the area. Amos is the perfect match for Grace; a knight in shining armor who will stand and protect whose who he loves. He was exactly what Grace needed. Each woman in town has a story, some of brutal abuse; Helen was abused by her father and hates all men. She has many issues to resolve. That is until she meets the man God has designed for her. Her story's heartbreaking, however, God has his hands on the controls ready to give Helen what she desires if only she will accept him. Witemeyer has many plot threads to bring together which she did skillfully. A well-written story with well-developed characters, highlighting their faith in God and his goodness, the pace of story never slowed or bogged down. With an original story-line and realistic likeable characters, I found myself immersed in the story and sorry to say goodbye to the citizens of Harper's Station. Always love how these books ring with humour, adventure, sweet love and spiritual growth. Let's throw some cliche's out here that Ms. Witemeyer has obliterated with this novel. Women are only attracted to macho men - NOT. Anything less than a macho man cannot be a hero - NOT. Every woman turns to mush when a macho man pays attention to her - NOT. A spindly, intellectual man cannot save the day - NOT. Good triumphs over evil - YES! (even if it takes a while) I loved this novel. As always, Ms. Witemeyer wrote a spectacular story, and I loved visiting with the women of Harper's Station once again. I highly recommend this book. I received this book free from the publisher/author. The above review is my honest opinion. Karen Witemeyer is one of my go-to authors. She consistently writes characters that exhibit strong Christian values and behavior. This book is no exception. The characters are well developed and I loved how they turned to God through prayer and the use of scripture when danger threatened them. They refused to let fear control them because they had God on their side. Even secondary characters are well developed and past hurts are healed for them through turning to God. Also, this book not only supplies one romance, it supplies a second one as well as suspense, danger, and some humor thrown in for good measure. Romance - PG, some kisses Language - clean Violence - reaches moderate level during a gun fight. My rating - 5 stars.